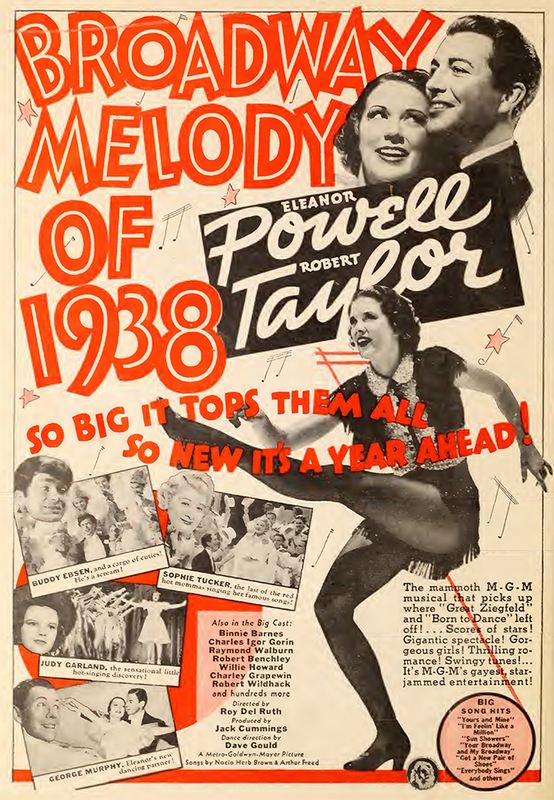 July 31, 1937: Judy was the breakout star of Broadway Melody of 1938. 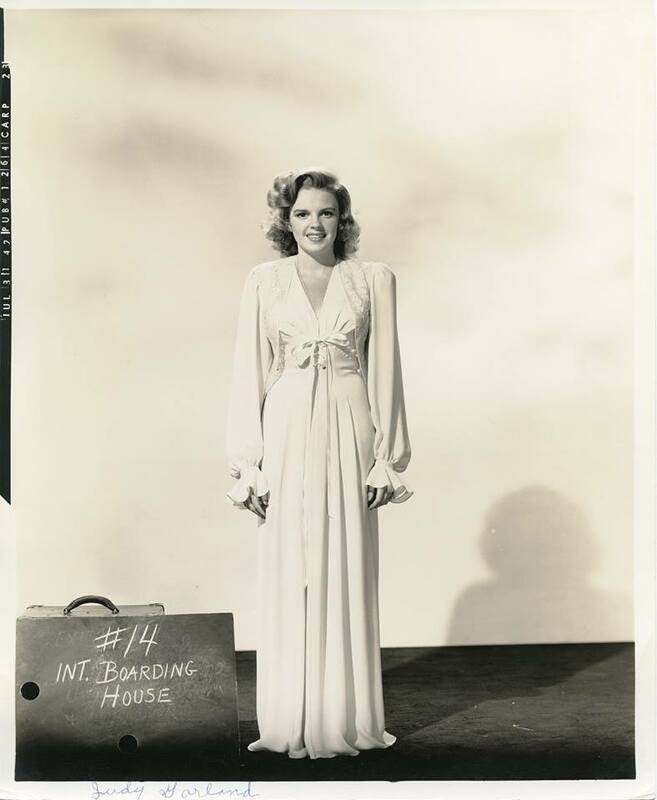 July 31, 1938: Judy appeared on the 1 hour NBC Radio show “Hollywood Swing Concert” along with Chico Marx, Tommy Dorsey, and more. 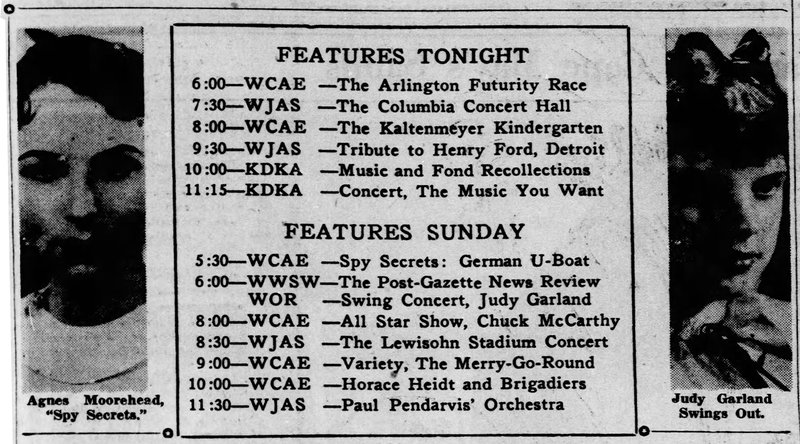 No information about the program is known as no recordings are known to exist. 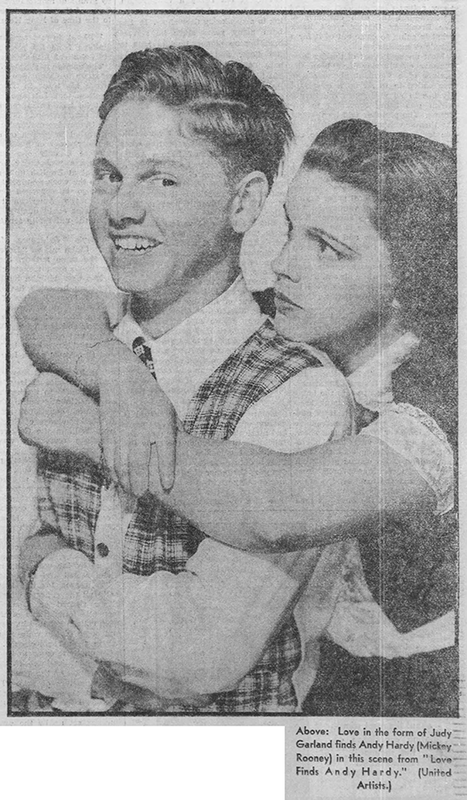 Love Finds Andy Hardy was in theaters getting great reviews, with Judy singled out as the highlight of the new characters introduced in this edition of the series. It’s safe to assume that Judy sang one of the songs that she sings in the film. 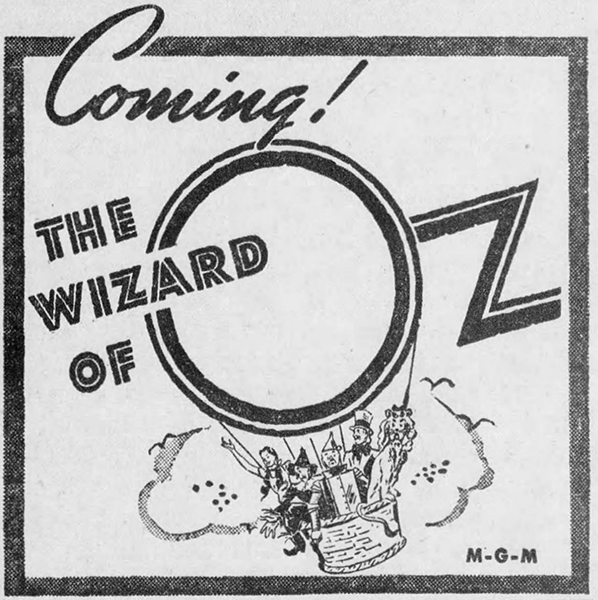 July 31, 1939: Advance buzz is that The Wizard of Oz is great! 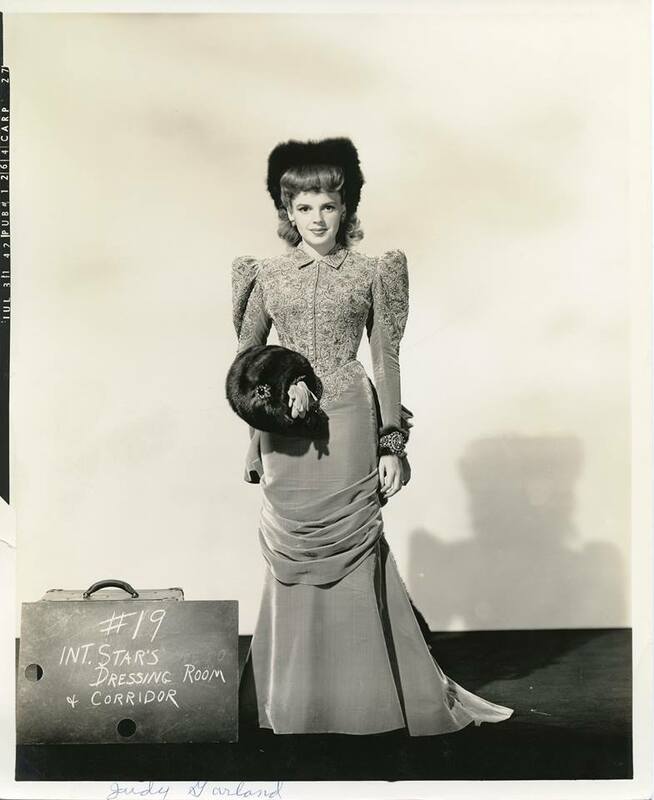 July 31, 1940: Little Nellie Kelly filming continued with scenes shot on the ‘Interior Noonan’s Cottage” set. 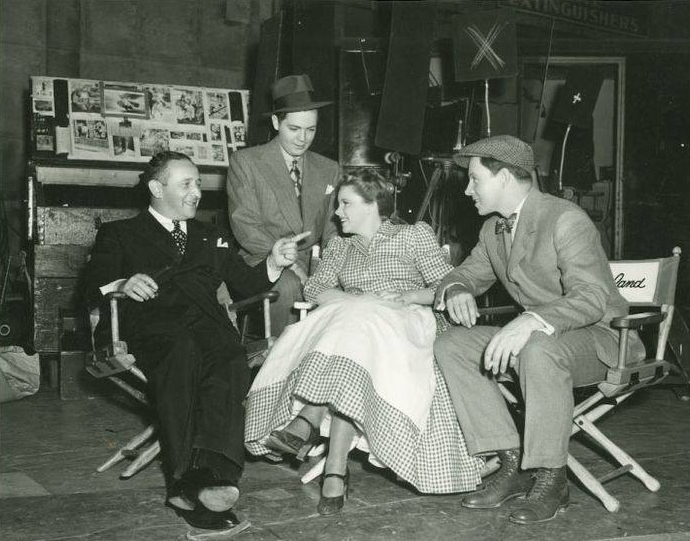 Time called: 9 a.m.; dismissed: 5:02 p.m.
Photo: Producer Arthur Freed, Douglas McPhail, Judy, George Murphy on the set. 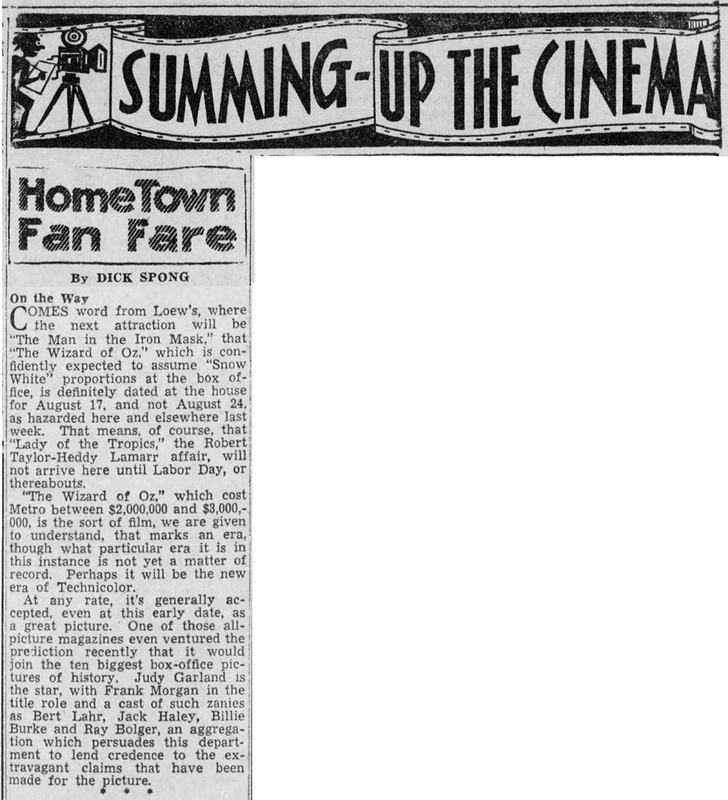 July 31, 1941: Babes On Broadway filming continued with scenes shot on the “Interior Stone’s Office.” Time called: 9 a.m. 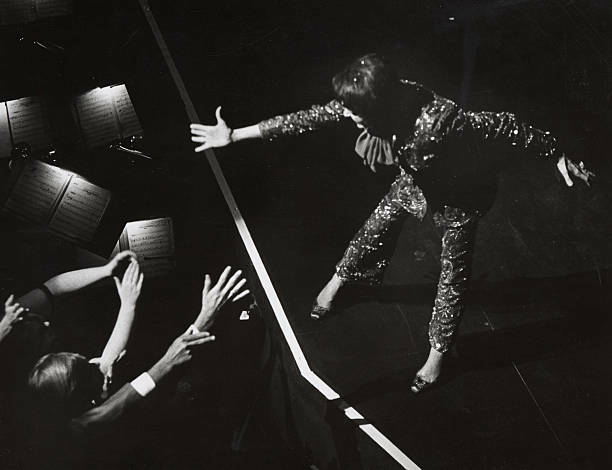 The assistant director’s notes state: “9:00-9:15 – Wait of JG to get into wardrobe, in her dressing room on state – was ten minutes late in makeup department this morning – overslept; 10:35-10:45 – Dr. Jones on set looking at Judy Garland’s hand which she said she injured on a door in scene yesterday – She first complained of this when she arrived on stage today.” Lunch 12:20-1:20p.m. 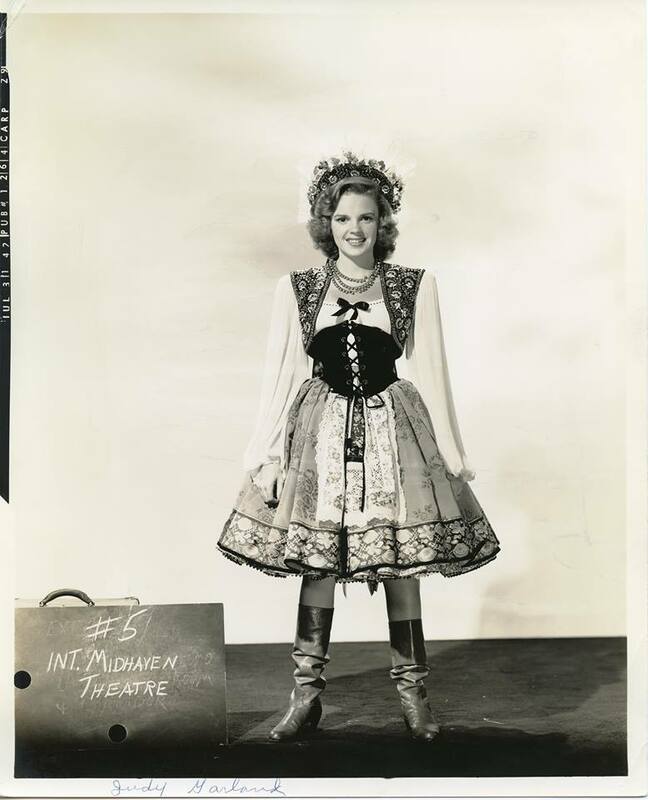 ; time dismissed: 6:15 p.m.
July 31, 1942: Judy posed for these costume tests for Presenting Lily Mars. 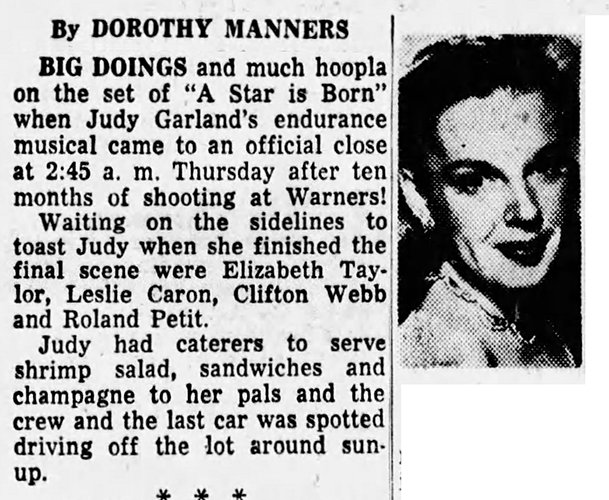 July 31, 1944: A busy day for Judy. From 10 a.m. to 3:30p.m. 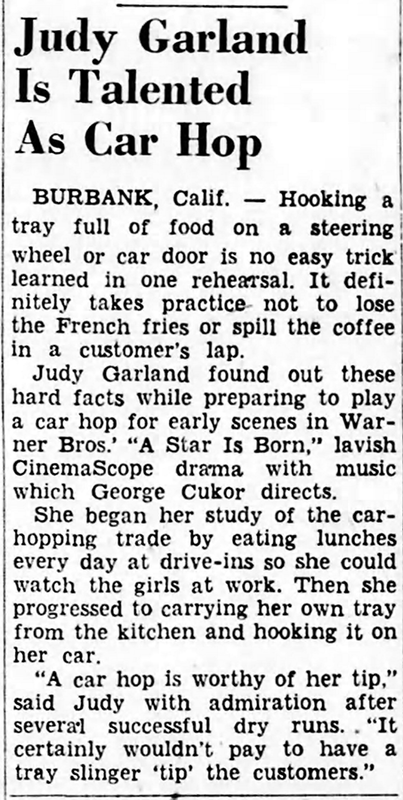 she was at MGM working on The Clock, specifically on a “silent photographic test” per the assistant director’s notes. Later that evening, Judy was at the Decca Records Studios in Hollywood with Bing Crosby. The two recorded duets of “You’ve Got Me Where You Want Me” and “Mine.” The session lasted from 7 to 10:15 p.m.
“You’ve Got Me Where You Want Me” was released on April 19, 1945, on the “B” side of Record #23410 with “Yah-Ta-Ta, Yah-Ta-Ta (Talk, Talk, Talk) (recorded on March 9, 1945, also a duet with Crosby) on the “A” side. The single peaked at #5 on the Billboard charts in late 1945. “Mine” was released on January 20, 1947, on the “B” side of Record #23804 with “Connecticut” (recorded on March 9, 1945, also a duet with Crosby) on the “A” side. 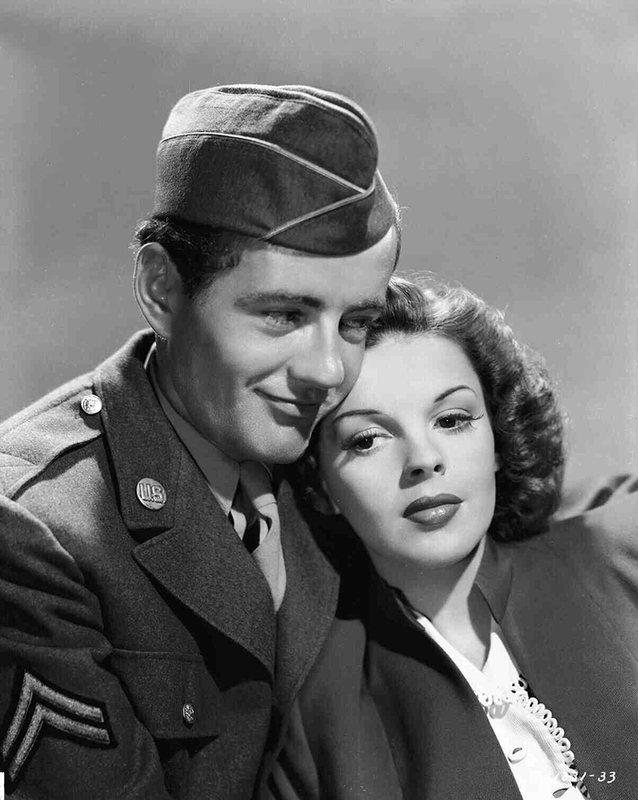 The singles can be found on the 2011 comprehensive anthology CD set from JSP Records “Judy Garland – Smilin’ Through – The Singles Collection 1936 – 1947.” All have been masterfully restored and remastered. 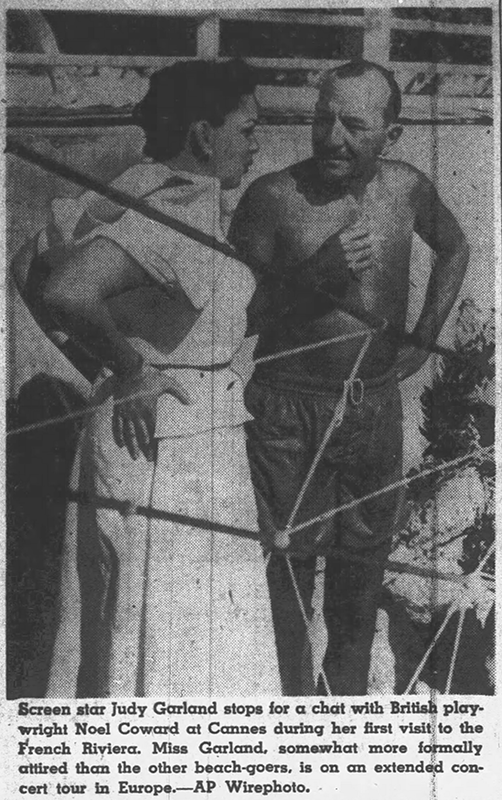 July 31, 1951: More from Judy’s time vacationing in the French Riviera. 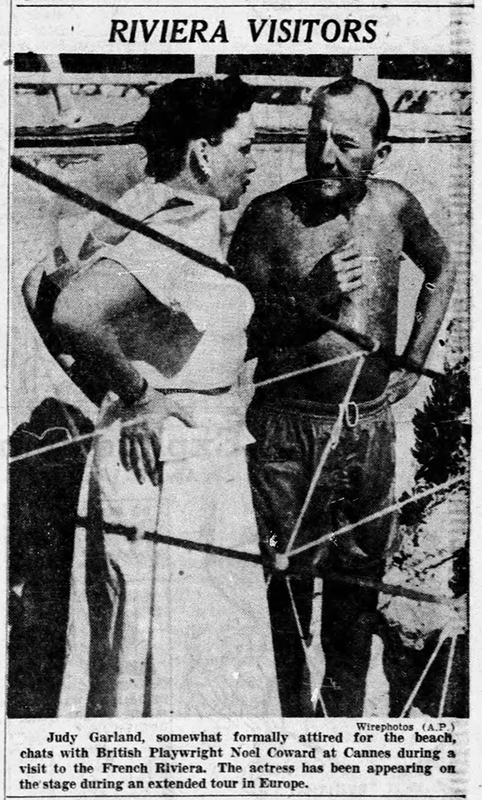 Here she’s seen with good friend Noel Coward. 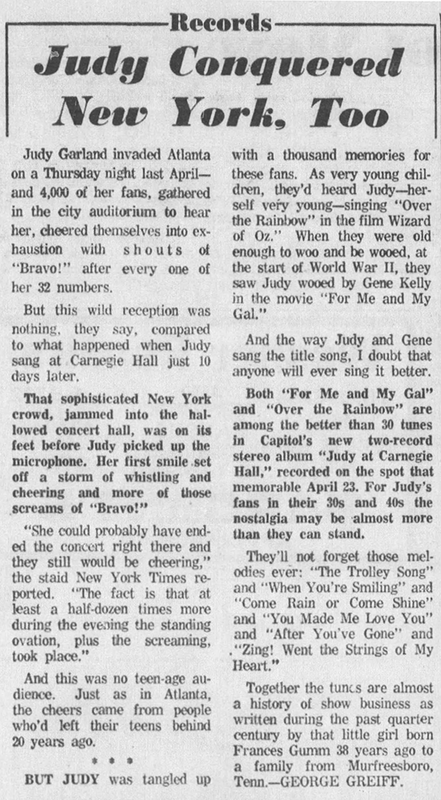 July 31, 1961: More for “Judy At Carnegie Hall.” The last item is from July 31, 1962. 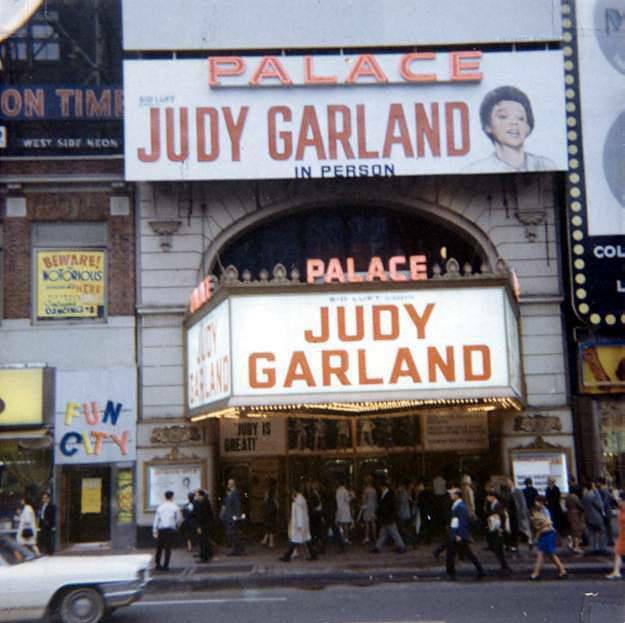 Earl Willson reports on Judy’s big earnings, still coming in a year later. 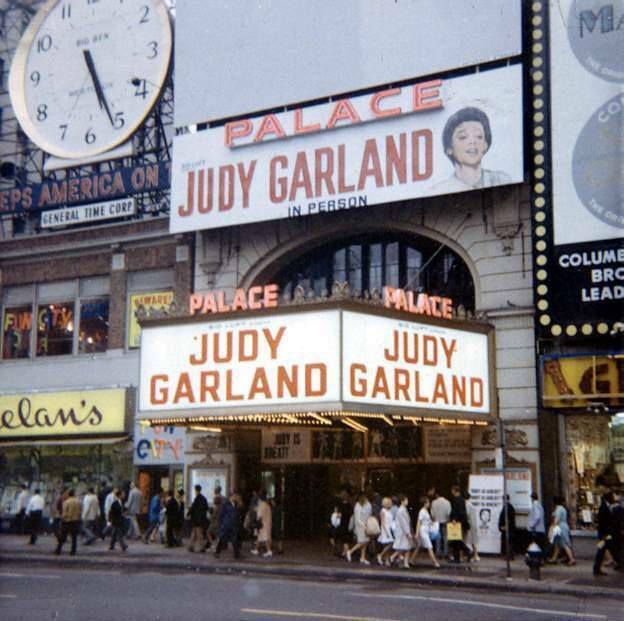 July 31, 1967: Judy opened at The Palace Theater in New York for the last time. 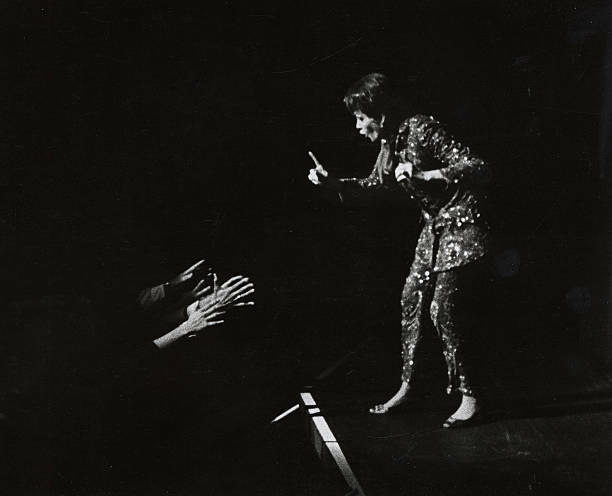 It was her third run at the theater which was the site of the launch pad for her legendary concert years in 1951, then a return in 1956. This final engagement ran through August 26, 1967. 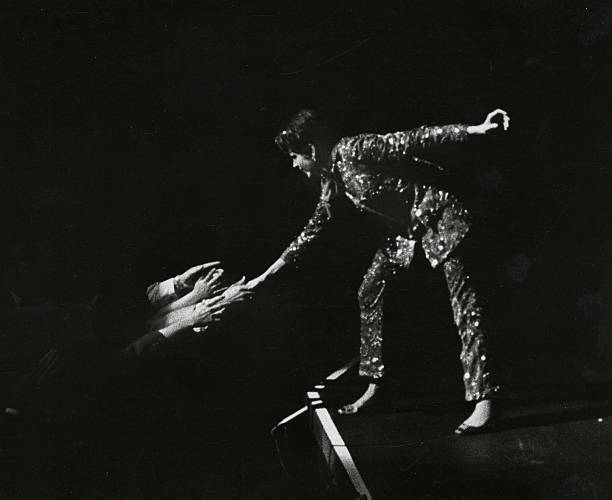 Joining Judy were her two youngest children, Lorna and Joey Luft as well as dancer John Bubbles, comedian Jackie Vernon, and juggler Francis Brunn. The last three opened the show, followed by Judy and eventually Lorna and Joey. Place Theater photos provided by Jon Perdue. Thanks, Jon! 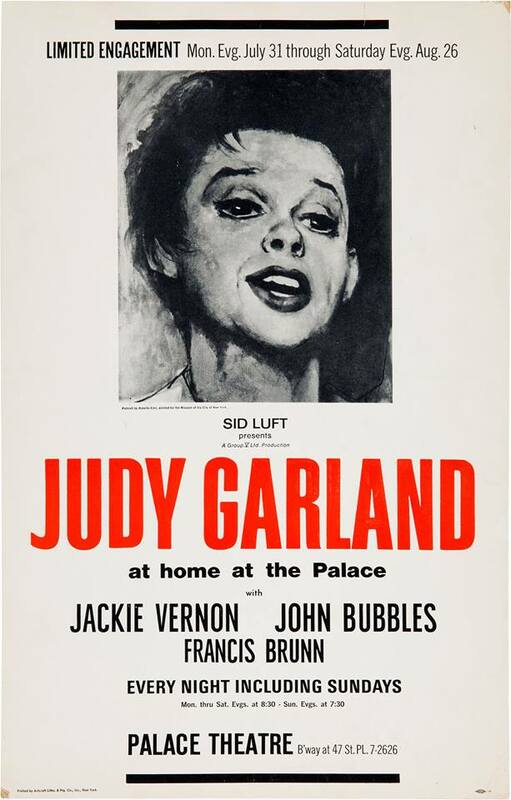 Part of the first night’s performance, Act One to be exact, was included on the ABC Records LP “At Home At The Palace” which was a compilation of Judy’s first three nights. Act One from this night is Side One of the LP. 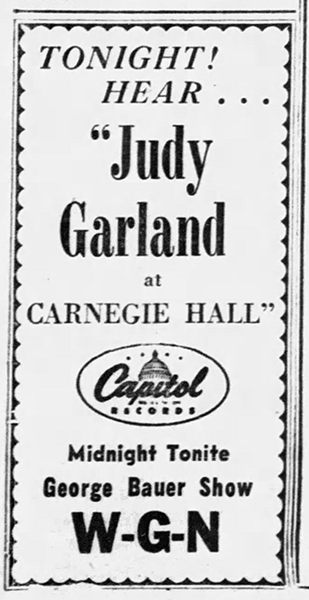 The album was the last legitimate release of a new Garland concert during her lifetime. Sadly, the master tapes of the complete three nights of recording are lost. Only the master tapes of the final album are known to exist. MCA currently holds the rights but has yet to release the album on CD. Download the remastered LP here (zip file).